-Letter from Dr. C.J. McSweeny to Sir William Bragg, 27 June 1938. The S.O.S. call rang through the BBC airwaves the evening of July 8, 1938. A small child was admitted to Ipswich Hospital exhibiting all too familiar symptoms. It had been over fifty years since the disease that ravaged the boy’s body was first clinically described, and even then, little could be done to prevent outbreaks. Not even Queen Victoria’s own daughter could be protected. Innocent coughs were the first sign, but soon, the chills and blue that crept through the skin would reveal the truth. The Ipswich staff had successfully treated several cases, but this particular case was different. The disease had developed with lightning rapidity, its course ignoring expected symptomatic patterns. Seeing the boy, the Medical Superintendent of the hospital declared the case hopeless. Soon, respiratory paralysis would strike. Even if by some miracle the child survived, life would not be kind to him. There was a solution to arrest the progress of respiratory failure, one the staff knew was quickly gaining ground in hospitals and journals. It wouldn’t cure the patient, but at least it could slow down the disease’s progress until some permanent solution could be devised, or until the young body had enough time to strengthen itself to ward off further deterioration. What they needed, however, was not available at Ipswich hospital; it was too expensive to justify to the hospital’s board, especially since the cases it was required for were uncommon. Even the cheaper variation was dismissed as a frivolous. Nevertheless, the staff convinced the Medical Superintendent of its necessity. There was no time to make phone calls to neighboring hospitals, so only one was made—to the BBC. It was shortly after midnight when porters from London Hospital arrived at Ipswich Hospital in response to the distress signal. One porter carried a black suitcase that held the apparatus requested: the Pulsator, an artificial respirator recently invented by a scientist and engineer. It was too late, the Medical Superintendent told the porters. The young boy had died. Over the next few days, newspaper reports questioned the events preceding the boy’s death. A life—and perhaps countless others—could be saved if there were adequate resources in hospitals. Six days later, the Minister of Health was questioned in the House of Commons over the inadequate supply of Pulsators. Fearful parents wondered whether the Pulsator or other similar apparatuses would be available should their own children fall ill and require one. Medical staff assessed the merits of the device, insisting city centers should establish spots where hospitals could readily access and share the apparatus. It was too important a technology not to be universally available. In 1927, Harvard University’s Philip Drinker (1894-1972) and Louis Agassiz Shaw, Jr. (1886-1940) developed an apparatus that could maintain artificial respiration for cases of respiratory paralysis. The “Drinker Respirator,” or the “Iron Lung,” as it was more commonly known, was a gigantic airtight steel box powered by an electric motor with two vacuum cleaners. Relying on the principle of negative pressure (in which the rib cage expands while the diaphragm contracts to fill the chest cavity), the apparatus used vacuum pressure to mechanically force a patient’s diaphragm to expand and contract, exerting alternating pressure through a push-pull motion. Able to regulate the rate and depth of respiration, the device allowed for prolonged respiration—either until the patient recovered muscle strength themselves, or until an alternative method of treatment was available. Demonstration of the Drinker Respirator in use, 1928. Philip Drinker and Charles F. McKhann III, “The Use of a New Apparatus for the Prolonged Administration of Artificial Respiration I. A Fatal Case of Poliomyelitis,” Journal of the American Medical Association 92.20 (1929): 1658-1660. The Drinker respirator was first used clinically on an eight-year-old girl at Boston Children’s Hospital. Stricken by poliomyelitis, an infectious disease causing muscle weakness and respiratory paralysis, the child was dying. On October 12, 1928, within minutes of being placed inside the respirator, the girl dramatically recovered from her paralysis. It seemed like suddenly, hope was available for paralytic patients, even if it meant they had to spend months, if not years, inside an iron lung. By the 1940s and 1950s, the iron lung became symbolic of polio, especially in the United States where epidemic figures kept climbing, reaching a peak rate of 37.2% per 100,000 persons in 1952. Crippling paralysis, however, was a rare complication. Moreover, the iron lung was expensive and limited in emergency situations; some hospitals lacked necessary funds for obtaining the machine, while others argued against its necessity. Indeed, even though Drinker and Edgar L. Roy offered instructions for building a makeshift respirator in emergency situations, the apparatus was still quite large and complicated to transport. The Iron Lung Ward at Rancho Los Amigos Hospital in California during the height of a polio epidemic, c.1953. Diphtheria remained one of the top leading causes of death of children. Although the bacterium was identified in 1883 and antitoxin and serum studies began in 1890, it would take decades before the disease could be properly immunized. Even though a diphtheria antitoxin was available in Europe, in many North American cities such treatment was unavailable domestically and had to be imported, often at rising prices. A vaccine known as “diphtheria toxoid” was also slowly adopted and distributed internationally beginning in the 1920s. While Canada was distributing the toxoid as early as 1925 and demonstrating a vaccine effectiveness of at least 90%, however, the United States and Britain were hesitant to adopt the vaccine. Chart of diphtheria in Toronto and the impact of the toxoid, 1929-1937. Sanofi Pasteur Canada, via Museum of Health Care exhibit. Britain did not introduce the diphtheria toxoid until World War II. Until then, alternative means for treating post-diphtheria respiratory paralysis, a serious complication of the disease, were required. Portrait of William Henry Bragg, 1915. Realizing the process could be mechanically replicated, Bragg devised an apparatus using two footballs: he took apart the bladders connected by tubing, bandaging one to the patient’s chest and the other placed behind a pair of hinged boards. This bellows device allowed pressure to be rhythmically compressed to the man’s chest, thereby allowing his diaphragm to contract and air to enter and leave his lungs. Rather than continuously pressuring the chest with her hands, a nurse or the wife could apply pressure by simply pressing on the pulsating rubber bellows. Unlike the Drinker respirator, Bragg’s invention used positive pressure to enforce expiration of air, much like manual ventilation. Realizing the benefits of his invention, in 1933 Bragg enlisted the help of scientific instrument maker Robert W. Paul (1869-1943). Paul was internationally renowned for his instruments, including the galvanometer, early wireless telegraphy sets and devices for submarine warfare; he is also famous today as a pioneer of British film, devising cameras and projectors for motion pictures. Portrait of Robert W. Paul, c.1896. Working at his home workshop, Paul modified Bragg’s invention by adding a small hydraulic machine that could be connected to the main water supply. The machine alternatively compressed and released the thick rubber bellows, thereby allowing the patient to be in any place and position his condition required, and reducing, if not eradicating, external assistance. A rubber bag disguised as a hollow waistcoat, was fastened around the chest and the bag connected to wide tubes to the pulsating rubber bellows. Furthermore, Paul ensured that the bellows could be actuated by hand and water power as well, if necessary; later models would rely upon electric power. Demonstration of the Bragg-Paul Pulsator in use, 1939. Medical Research Council (Great Britain), no.237, Report of the Respirators (Poliomyelitis) Committee. From 1933 to 1963, Paul’s modification of Bragg’s invention was used almost continuously on Bragg’s neighbor, causing about 15,000,000 involuntary respirations, in regular use about 10 hours a day. A hand lever allowed anyone to sit in a chair and compress/release air in the bladder. The wife was thus able to give artificial respiration to her husband while she sat and read to him. It is most interesting to learn that so simple an apparatus has been used with such success. The principle of your arrangement seems to be just the opposite to that of the Drinker Respirator, but the same as artificial respiration as normally understood. I am sure that the details of your arrangement would be of immense interest and value to many Hospitals and Medical Men…If you have no objection, I propose making an apparatus such as you describe for use at this Hospital. I am certain that a semi-mechanical respirator would often be most useful, and would save labour and Staff. Only two days ago, a patient was admitted, as the result of an accident, and prolonged artificial respiration had to be employed. Had your apparatus been available, much labour and fatigue could have been obviated. To garner interest amongst the “Medical Men,” in January 1934, Bragg invited physiologist A.V. Hill (1886-1977) to examine the machine at work. Marveling at the simplicity of the device, Hill suggested Paul get in touch with Dr. Poulton at the London School of Hygiene and Tropical Medicine to assess the physiological benefits of the apparatus. Hill mentioned that a similar German apparatus was in existence but had failed because the positive pressure was injurious to patients, at times inflating the heart with mucus and blood. Poulton also invited Bragg and Paul to present their device at the Therapeutic and Pharmaceutical Section of the Royal Society of Medicine. At a time when British women were struggling to secure placement in universities, Phyllis Kerridge distinguished herself as a prominent scientist and renowned collaborator. With an impressive list of credentials—a BA and MA in Chemistry (1922), a PhD (1927), a MD (1932) and membership in the Royal College of Surgeons and licentiate in the Royal College of Physicians (1933)—she was especially qualified to work with Robert Paul on modifying the Bragg-Paul apparatus. “Mrs. Kerridge is going to work out the most valuable position of the rubber bags round the chest on a normal subject at the School of Hygiene,” Dr. Poulton wrote to Bragg in a letter dated February 12, 1934. Subsequently, Poulton hoped to make clinical tests at Guy’s Hospital, seeing its potential value for treating asphyxia in newborns. After testing the physiological parameters of the device, Kerridge suggested simplifying the “waistcoat” aspect of the device, adding a 38” x 10” air bag lined with canvas and vulcanized together, thereby allowing the lining to avoid the awkward bellying of the bag, and thus requiring no other belt. She also suggested, as per Poulton’s advice, that a smaller version of the device to be developed for newborns. Her tests went a long way towards perfecting the device. Additionally, Kerridge’s tests provided Paul with significant physiological measurements for improving the measurements of ventilation, namely the modification of the form and application of the air-belt. Although seemingly minor, such changes dramatically increased the efficiency of the device while also ensuring a patient would comfortably able to withstand sustained pressure on the chest. Nevertheless it is so rare for children to recover after respiratory paralysis complicating diphtheria, that I think we are justified in saying that the apparatus saved the child’s life. A promotional article on the Pulsator, with the device strapped to Phyllis Kerridge’s laboratory assistant. Popular Science, August 1934. By 1938, Pulsators were distributed to hospitals in Manchester, Birmingham, London, Norwich, Ipswich, and Liverpool. Many more were on back-order, particularly as that year witnessed several polio outbreaks and an increased number of diphtheria cases in children. Ventilators were in short supply, and as the Pulsator was portable, it was more prominently used in emergency situations. The device would have continued to be used into the 1940s, had it not been for William Morris, the Lord Nuffield (1877-1963) who offered to supply Both Respirators (a cheaper plywood iron lung) to hospitals in Britain and the Empire at his own cost. Perhaps the most dramatic use of the Bragg-Paul Pulsator occurred in June 1938 in Dublin. In the 1930s, diphtheria accounted for a large portion of admissions into Cork Street Fever Hospital, which was directed by Medial Superintendent Dr. C.J. McSweeney. A progressive physician, McSweeney led the fight against diphtheria and sought to include better methods of treatment. Hearing about the Pulsator and its benefits for prolonged artificial respiration, McSweeney ordered one for the hospital. If the lives of 38 children wasn’t sufficient proof of the power of the Pulsator, for a short time, the device even eased border tensions between Northern Ireland and the Republic of Ireland. In July 1938, McSweeney received an urgent message from Dr. Gardner Robb, Medical Superintendent of the Belfast City Fever Hospital (Purdysburn) asking for a Pulsator on loan. A child with post-diphtheric paralysis was admitted in emergency and was quickly dying. With the cooperation of Custom Authorities at the Border, the Pulsator travelled a distance of 166km for three hours from Dublin to Belfast, in time to save a child’s life. 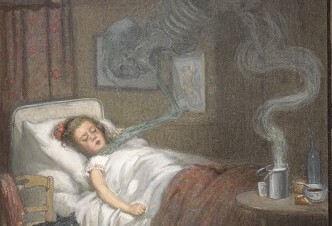 Cover image: A ghostly skeleton trying to strangle a sick child, symbolizing the disease diphtheria. Watercolor by R. Cooper. David M. Oshinsky, Polio: An American Story (Oxford: Oxford University Press, 2006), 61. Daniel J. Wilson, Living with Polio: The Epidemic and its Survivors (Chicago: University of Chicago Press, 2005), 14. Royal Institution of Great Britain, William Henry Bragg RI Admin Correspondence, 1933-39. L.E. Bayliss and Phyllis M. Tookey Kerridge, “Recent Developments in Physical Instruments for Biological Purposes,” Journal of Scientific Instruments vol. 10, no. 1 (January 1935): 1-5. Royal Institution of Great Britain, William Henry Bragg RI Admin Correspondence 1933-39.